RonDoids: You Won't Hear About this On MSNBC or CNN, Why? You Won't Hear About this On MSNBC or CNN, Why? on move with migrant caravan! Border Patrol agents arrested a gang member and a newly released convicted murder last weekend, both said to have traveled to the border with the migrant caravan. U.S. Customs and Border Protection officials said the first incident occurred on Saturday at 6:09 p.m., when agents were alerted to a man attempting to enter the country just east of the Calexico Port of Entry. During an interview, 29-year-old Jose Villalobos-Jobel told law enforcement that he was a citizen of Honduras and an “active gang member” belonging to the notorious MS-13 criminal organization. He also admitted to traveling with the migrant caravan from Central America. He was being held pending a repatriation hearing. The second arrest came hours later, when agents noticed three people attempting to cross the border illegally just east of the San Ysidro Port of Entry. CPB said that while interviewing the men in custody, agents discovered that one man, 46-year-old Miguel Angel Ramirez, was released from a prison in Honduras four months earlier and had been held there for a murder conviction. Officials with the San Diego Sector Border Patrol’s Foreign Operations Branch confirmed this with the Honduran Consulate in Los Angeles, which said that Ramirez had been serving 10 years for a homicide and three years for robbery. He also claimed to be traveling with the caravan. The other two men, 22 and 38, were also arrested and were awaiting deportation proceedings. 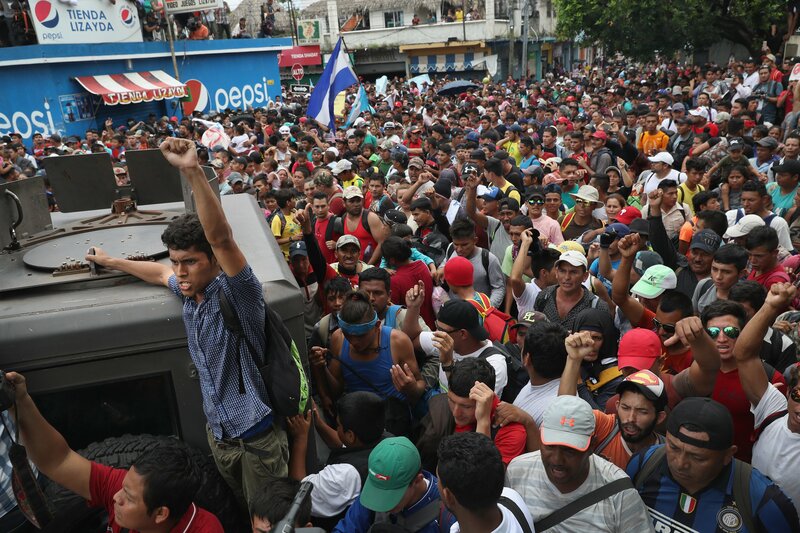 There are at least 6,000 migrants who traveled caravan-style from Central America currently in Tijuana, Mexico.